The New Year has got off to a great start with our first home open meet of the year! It was very busy as usual with over 300 swimmers attending from 18 clubs across Sussex and Hampshire. 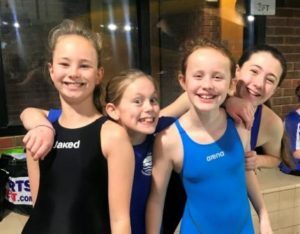 This is always a tough meet straight after the Christmas break – it’s surprising just how quickly swimmers can lose fitness, so we never expect a huge number of PBs at this meet. Yet we saw a good number yesterday, along with 12 new County Championship Qualifying Times from Holly Brockwell, Emily Carman (2), Will Clark (2), Edward Condron, Oliver Napier, Becky Smith, Matty Smith and Archie Strowger (3). Some good skills improvement too which was very pleasing and some areas we will work on in training. A fantastic well done to every one of you! A huge thank you to all of our meet helpers and officials from both Littlehampton and all of our visiting clubs. We hope everyone had an enjoyable day and a safe journey home.